Wednesday comes once a week, but sometimes it seems far too often when I am trying to share what is on my desk, and so often there is very litle of interest there. If you want to know why I am sharing, just take a trip to the Stamping Ground where all will be revealed. 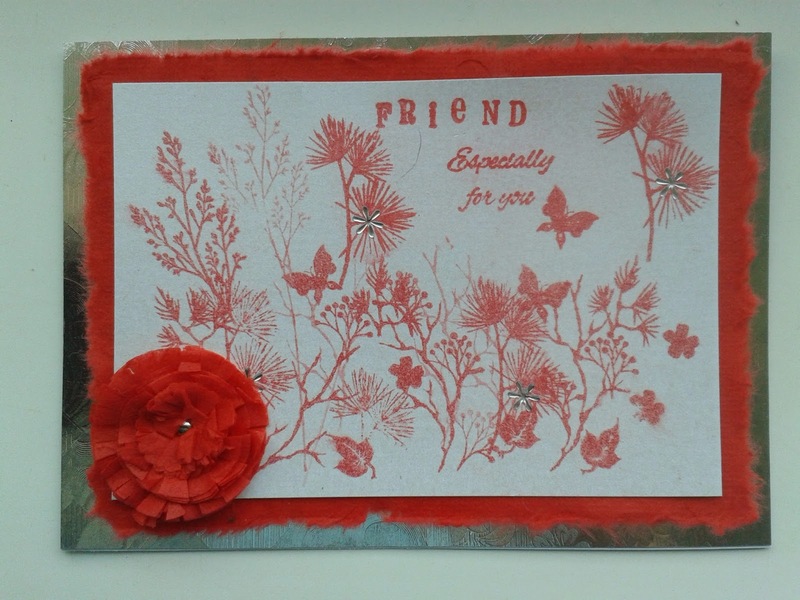 A bit of play with distress ink, a lacey die cut and the die folder and box of distress inks. Oh and the broken necklace still at the back and the pile of Christmas bits also at the back. Not had a lot of time to make anything over the last few days. Daughter no.2 came to stay with grandson no. 3 and on Saturday we took them down to the boat to move it from Middlewich to Barbridge. So they stayed on the boat and I had to do the car/boat leapfrog. Doing a lock, back to the car and drive to the next lock in time to help with that one before repeating the process, and unfortunately the locks aren't always very close to roads, so it means parking the car and hiking a distance along the towpath. Then on Sunday, daughter no.1 and grandsons 1 and 2 and hubby arrived to take the boat up the Llangollen canal for half term, so we were back down to Barbridge to hand over keys and give instructions, and travel through the first 4 locks with them and we would come home in the car we had parked just beyond the lock. Fortunately the car hop had been done with two cars so I didn't have to do any significant walking this time. At this point the plan was OH and daughter no 2 and grandson and I would come home and have a quiet day on Monday, with just a quick trip to Abakhan, to relieve the boredom. However just as we were getting ready to leave, grandson no.3 decided that he liked this boating lark and being with his cousins, whom he see very rarely, so it was agreed that he would stay with them on the boat overnight and I would drive down, another 50 miles each way, to collect him. So Monday was 2 hours in Abakhan, very restrained craft shopping, 60 pence worth of embossed vellum, and then the 50 miles, down single track roads, to bridge 53 and back again, exhausted. Then while I was preparing supper grandson and daughter were playing with all my craft stuff, so what you can't see on the very left of the desk, is a big pile of paper that they had played with and just left because they didn't know where to put it away. Just before I go, I will share a couple of cards I made before the weekend. This one was for a friend from my craft club. I wanted something in pinks and purples, her favourite colours. And this one on the subject of Friendship for a group I belong to. Well that's all for now, I am going to spend the rest of the day making Christmas cards, I hope. Golly, Chris. What a manic weekend. Hope Grandson 3 had a great time with his cousins. Trust all are now safely back home and you can do a bit of crafting. 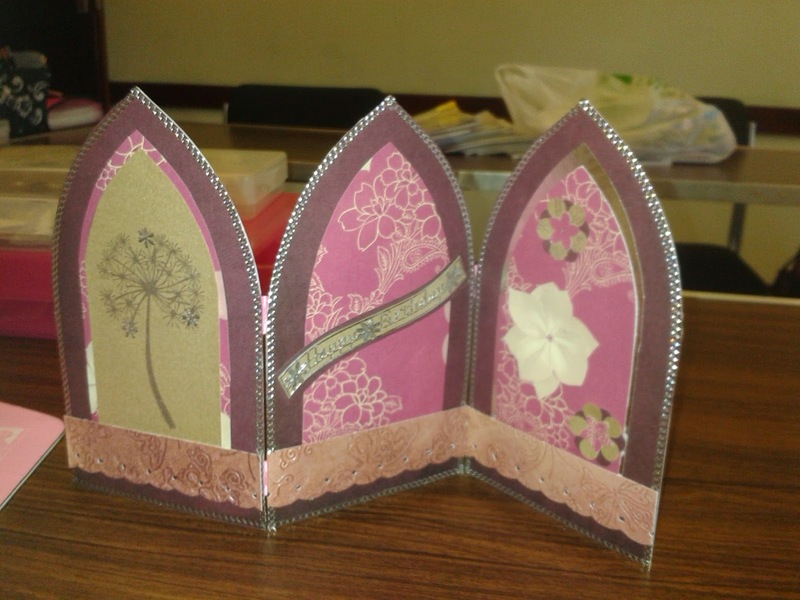 Lovely finished cards - don't know when you found the time, really, with all that driving and walking! Take care. God bless. See you soon. Fancy the fireworks off the pier on Saturday evening, or is that when you are collecting the boat? And there was me thinking life on the canals was slow and peaceful :-) I'm exhausted just reading about it hehehe. Love the Arch card - what a brilliant idea!! Sounds like you're due for some crafting time!!! 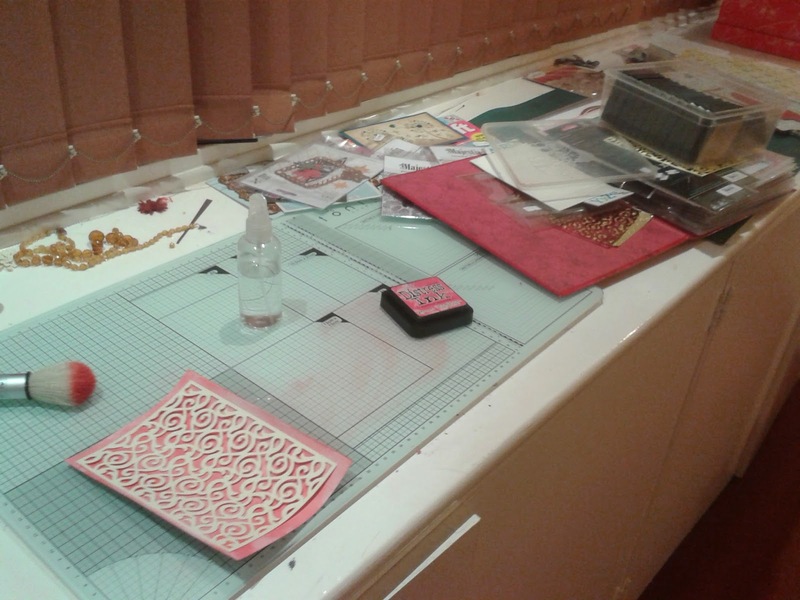 Enjoy the Christmas card making. It's what I'm working on too. Me too, been trying to get the christmas cards made early but the time just speeds past. wow that is a lot of travelling and I am exhausted already, the boat does sound interesting, we don't have locks here. Awesome card creations too. Enjoy your family. Sorry just getting to visit till now, DD stole my computer and I didn't want to reply on the iPad as it takes forever. Just wonderful card work there Chris well done, love them both. .. and been on Llangollen canal too have an large etching of it given of the bridge we went over hanging up in this room believe it or not :D its a beautiful little town too and they had lovely caramels if my memory serves me correctly, in a wee shop there..
.. did not buy enough of them of course..